Finesse specialises in Weddings and Events. We design floral arrangements or balloon decor especially for you to suit your style, whether it's something simple and elegant or lavish and extravagant or for a special theme - our designs will always be inspirational and individual. We take great pride in our creations and the tailor-made service which we provide for many different types of occasion. Our fully qualified florists and balloon artists come to you, to provide a friendly, one on one, personalised service, focusing on your individual needs, to ensure stunning designs at highly competitive prices. What can Finesse provide for you? 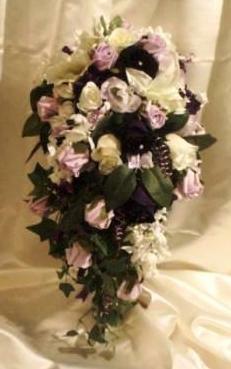 Finesse specialises in providing tasteful, realistic looking artifical flowers. We only use high quality colourfast bridalcraft roses, which are very cost effective and come in a huge range of colours to suit any colour scheme. We also use silk flowers and foliage, which are of the highest standard. Although Finesse specialises in artificial flowers, we can also provide beautiful fresh flower arrangements. All of our fresh flower arrangements are made using fresh flowers specifically purchased for your special day. Finesse is commited to quality and freshness, so our fresh flowers or plants are sourced from the renowned flower markets of Holland, local English growers and global growers for more exotic blooms. Table centrepieces and room decor are available in many different styles, utilising a myriad of different accessories, such as: glasswear, birdcages, candelabras etc. We can also provide bay trees, swagging, fairylights, wishing trees, post boxes, table plans, candy buffets and favours. Finesse is centrally located within easy travelling distance of Central London, Essex, Hertfordshire and Kent.